The Samsung Galaxy S4 delivers an effortless user experience (view larger). 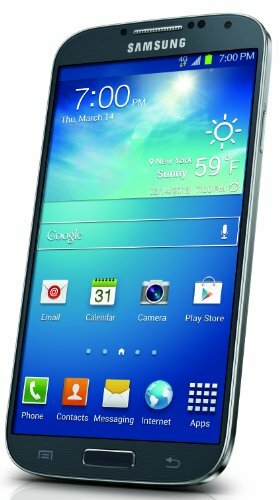 Make every moment of your life meaningful with the Samsung Galaxy S4 from Verizon Wireless. The Galaxy S4 does what you want and what you didn't know was even possible. Erase a photo's background distractions with just a touch, catch every part of your child's somersault, or capture your view of the city skyline. Preview photos and files or read a news article without ever touching the screen. Use one screen to check Facebook as you catch up on email. Offering a highly crafted design with a larger screen and improved battery life, the sleek and innovative Galaxy S4 is slimmer yet stronger, with less to hold yet more to see. 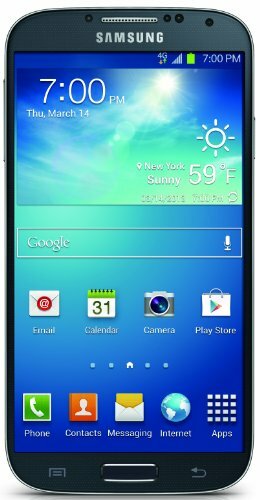 The Galaxy S4 features a 5-inch Full HD 1080p Super AMOLED touch-enabled display, a 1.9 GHz quad-core processor, a 13-megapixel rear camera with Full HD 1080p video recording capabilities, 2-megapixel front camera, 16 GB of storage plus microSD memory expansion up to 64 GB (via optional card), 2 GB of RAM for excellent multitasking, a full complement of wireless connectivity (including Wi-Fi, Bluetooth, and NFC), and enterprise-ready security features. Catch Any Moment, Keep Every Memory Equipped with a 13-megapixel rear camera and a 2-megapixel front-facing camera, the Galaxy S4 also boasts a Dual Camera function that allows simultaneous use of both front and rear cameras. When capturing moments, you can choose from a variety of frame effects that blend the two pictures naturally and also adjust the size of the small picture inside the big one. You can also select from eight different ways to combine the two photos taken by the front camera and the rear camera. The camera includes 12 shooting modes, including the Drama shot mode that enables you to see all the action in one continuous time-lapse and Sound & Shot for storing sound and voice together as the picture is taken. Additionally, the Dual Video Call function enables you to make and receive a video call with friends and family while showing what you are looking at during the call. Your special moments can be automatically stored in a photo album with the Story Album function. Photos are automatically gathered and sorted out according to your timeline, geo-tagging information, or a specific event to create a photo album. And your photos and videos are showcased on the world's first Full HD Super AMOLED display. Its 5-inch screen has a 441 ppi (pixels per inch) pixel density for stunning viewing quality and Corning's Gorilla Glass 3, making it stronger and more resistant to scratches and cracks than ever before. Bring People Together More than just a personal device, the Galaxy S4 makes the most of your relationships and enables you to easily share and experience many of life's pleasures together with family and friends, wherever you are. With the Group Play function, you can enjoy music, photos, documents, and games with those around you without even requiring a Wi-Fi or cellular signal. You'll be able to connect directly to other Galaxy S4 users instantly. For example, the Share Music option enables you to have the same song playing on multiple phones in sync to create the best party atmosphere. Spec Highlights 3G/4G LTE connectivity(LTE available in limited markets) Android 4.2.2 (Jelly Bean) with TouchWiz enhancements 1.9 GHz quad-core processor 5.0-inch touchscreen Full HD display (1080 x 1920) 13-megapixel rear camera; Full HD 1080p video capture Front-facing 2.0-MP camera 16 GB storage + 2 GB of RAM Wireless-N Wi-Fi + Bluetooth 4.0 + NFC 2600 mAh battery for a full day of use Slimmer yet stronger, with a 5-inch Full HD Super AMOLED display (view larger). Effortless Experience The GALAXY S4 ensures that tasks are effortless with innovative features that detect your face, voice, and motions to enable screen control with no need for finger touch activation. Samsung Smart Pause enables you to control the screen by where you look. When you are watching a video, the video pauses when you look away and then it starts right up again when you are back. Samsung Smart Scroll allows you to scroll the browser or emails up and down without touching the screen. It recognizes your face looking at the screen and movement of your wrist, and then it scrolls the pages up or down accordingly. Air View enables you to hover with your fingers to preview the content of an email, image gallery, or video without having to open it. You can even see a magnified view on the internet browser, or a phone number saved in the speed dial on the keypad. Air Gesture allows you to change the music track, scroll up and down a Web page, or accept a call with a wave of your hand. With S Voice Drive, you can activate commands via voice control for optimization when driving. Once connected with a car's Bluetooth connection, the phone automatically turns into driving mode to convert text to speech so you can easily and safely check messages with no need to look at the screen. Samsung Optical Reader automatically recognizes text, a business card, or QR code information, providing useful functions such as translation, call, text message, and search. Take it at Your Own Pace Offering a number of features for first-time smartphone owners as well as those switching from another operating system, the Galaxy S4 has a streamlined start-up wizard so you can begin using the device faster and learn about its unique features from the start. Originally introduced with the Galaxy S3, Easy Mode has been enhanced by simplifying the home screen layout, camera, calendar, messaging and the internet browser to make the settings menu easy to navigate. Once you're more comfortable with the Galaxy S4, you can switch back to the standard home screen interface. The Smart Switch PC application enables you to transfer contacts, messages, photos, music, calendar notifications and more from another phone to the Galaxy S 4. Smart Switch can identify favorite applications and recommend the same or similar applications within Google Play. A Smartphone That Makes TV Better With its infrared sensor (the same technology as your remote control), the Galaxy S4's WatchON feature can change the TV channel from your phone. And you get a custom TV guide that shows you what you like to watch. With Samsung Hub, you can watch more music, movies, and games with one app and one sign-in. Protect Your Information Not only ideal for personal use, the Galaxy S4 is also a SAFE-designated device, which means it has additional security features to safe-guard sensitive data and communications. 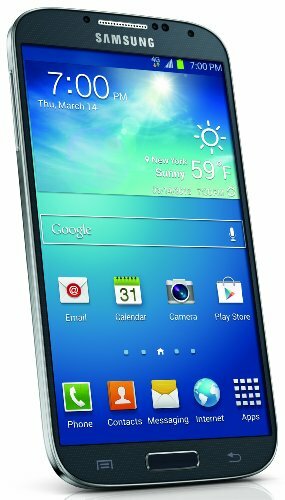 The Galaxy S4 is the first Samsung device to include Samsung's KNOX solution, which provides comprehensive mobile security at the hardware level and enhanced personal privacy for individuals at the software level. It delivers industry-leading mobile security for companies with stringent security requirements, and allows IT managers to access and manage the passcode-protected work information without disturbing the content within an individual's personal space (including photos, emails, music files and social network data). 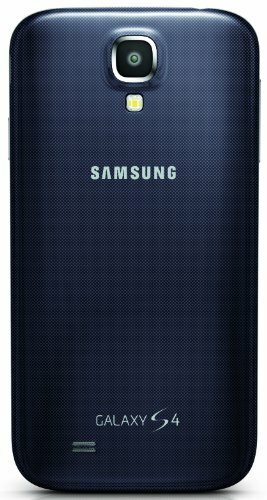 What's in the Box Samsung Galaxy S4 smartphone, 2600 mAh battery, USB cable, wall charger, quick start guide The Amazon app suite is one swipe from the device’s main home screen. Sign in using your Amazon.com account. Seamless Access to Digital Content and Shopping with Amazon App Suite The Amazon app suite provides seamless access to Amazon digital content and shopping right from your phone’s home screen. Interact with Amazon digital content you already own, access over 23 million games, books, apps, and songs, as well as shop millions of physical products in a single, fully-integrated, and easy-to-use experience. All the Content Get instant access to over 23 million games, books, apps, and songs including all of the most popular Android apps and games, over 20 million songs to download or instantly stream, and over one million Kindle books in the Kindle Store, including New York Times best sellers and new releases. Seamless Shopping Instantly access Earth’s biggest selection with millions of physical products available to search or browse with the integrated mobile shopping experience, plus all of the benefits of shopping on Amazon, including personalized recommendations, customer reviews, 1-Click ordering, Prime FREE Two-Day shipping on over 15 million items, and more. Cross-Category Search Discover Amazon’s full selection of physical products, Kindle books, music, and apps from a single search directly from your phone’s home screen. Single Sign In Enter your Amazon.com login just once to access all of Amazon Mobile Shopping, Kindle, MP3, and Amazon Appstore for Android apps, receive personalized recommendations, and interact with the Amazon digital content you already own right from your phone’s home screen. 1-Click Ordering Quickly and easily purchase new Kindle books, music, apps, and physical products with Amazon’s 1-Click Ordering, which allows you to skip the shopping cart and checkout process by using the default payment method and shipping address on your account. "Buy Once, Enjoy Everywhere" With apps available on the largest number of devices and platforms, Amazon makes it easy for you to access your content anytime, anywhere, from virtually any device or platform you choose. You can read and sync your Kindle books across any device with the Kindle app installed, including Android phones and tablets, Windows 8 tablets, PC, Mac, iPad, iPhone, and in your web browser with Kindle Cloud Reader. World-Class Customer Service When a customer shops on Amazon, they know they’re getting Amazon’s world-class customer service. Amazon’s customer service just scored 89 on the ForeSee customer satisfaction score – the highest ever attained by a retailer – as well as the highest rating on the 2012 American Consumer Satisfaction Index, and the J.D. Power Customer Service Champion Award. So far in 2012, Kindle customer service has received a 97.1% satisfaction rate from customers. Customers have been shopping on Amazon for 15 years, and they continue to do so because of the unparalleled end-to-end customer experience.